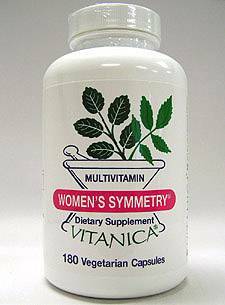 Vitanica's hypoallergenic preservative free, high potency, multiple vitamin and mineral supplement has been specifically designed for nutritional needs and preventative health factors that are important for women. Unique in their formulation is a higher amount of folic acid, Betatene(r) (includes 6 natural carotenoids), and calcium citrate-malate. Vitanica has selected premium forms of our nutrients to ensure maximal absorption and effect. Their multiple contains no artificial colorings or flavorings, sucrose, glucose, starch, lactose, salt, corn, wheat, soy or milk derivatives. 1-2 capsules a day to complement a balanced diet and lifestyle. 3-4 capsules a day to promote a well-balanced maintenance and therapeutic level of supplementation. 5-6 capsules daily to provide high potency supplementation for chronic conditions, high stress, or athletes.